What grows on ceramic pots? And its not feet! When was the last time you paused and really looked at a handmade pot? Brooks Bouwkamp, a C2C Gallery artist, has focused on growing crystals on his pots exclusively for several years.. His kiln firings are very technical. I don’t have the patience for it. I fire my gas kiln by sight and sound. The roar and color of the flame. Brooks has to adjust his electric kiln at certain temperatures to make the crystals grow. He never knows where they will grow on a vase or cup. 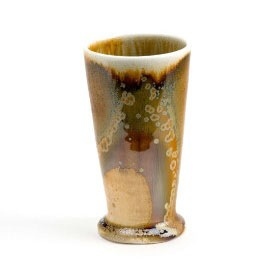 Crystalline glazes are seductive and instantly capture the eye. Think floating galaxies, frosty windows, rare gemstones, or flowers. Enthusiasm for this type of pottery has greatly increased over the last few years, perhaps because of new advances in kiln technology and computer temperature controllers. Many more potters are now exploring the potential of this glaze technique, making new and exciting discoveries. Chemistry, kiln firing, and form are the main ingredients in Brooks Bouwkamp’s pottery. He uses crystalline glazes on his pots to create crystals that almost look like fireworks or snowflakes. First, he throws the porcelain pots on the potter’s wheel. He makes mostly vases and cups. The pots are left to dry and fired the first time. He then mixes crystalline glazes for the second firing. These pots are fired to 2350 degrees fahrenheit slowly cooling the kiln to different temperatures, holding at different points, and cooling again. During that time, the crystals begin to form on the porcelain. The longer the pots are held at a certain temperature, the more the crystals grow. Although Brooks can’t control where they grow, he can control the size, shape and color. Some of the crystals contrast the main color of the pots while others are just a different shade of that main color. 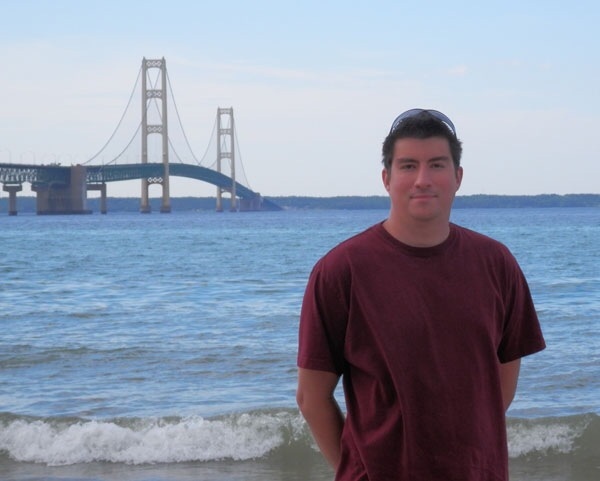 Brooks lives in Benton Harbor and has a Bachelor of Fine Arts Degree in ceramics from Andrews University. 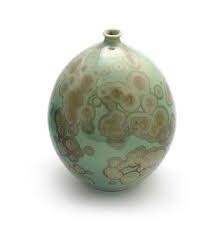 His pottery can be found in galleries across the United States, and even some books. In the gallery we have white, green, blue, bronze, and orange pots. Stop in today to check out these amazing pots. Next time you are in the gallery, take a look at them. If you can’t find them, ask us so that we can show Brook’s crystalline work to you.